should keep in mind when testifying. Your Newport Beach personal injury lawyer will recommend that you fully think through your response before responding to a question. This tactic will also help you to avoid answering questions that have not been asked. You may anticipate what you believe the Newport Beach personal injury lawyer for the defendant will say, but blurting out an answer before the question is asked can sometimes backfire. Wait for the entire question to be asked before you begin to respond. There is no time limit involved, so take adequate time to make sure that you understand the question and have a proper response ready before you respond. A common mistake that a Newport Beach personal injury attorney observes is when a witness talks too much. 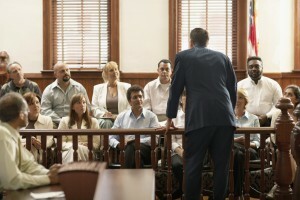 This tactic may make the witness say something that can damage his or her case without that individual even realizing it. Instead, when asked a question during cross-examination, witnesses should answer the questions concisely and directly. If you would like more information on your conduct while giving testimony in your personal injury case, contact Russell & Lazarus APC by calling 949-851-0222 and setting up an appointment to discuss your case in further detail.